I am secretly preparing to be a granny. Even though I prefer knitting (I really do), these hexagons are sucking me in! Someday they will grow up to be an afghan, and probably have children of their own. I wonder which yarn you used. Missy – it is Cascade 220, all wool. Although Greek cotton sounds fun too! What color will you use to join them? I am learning to knit but I really enjoy crocheting. What pattern are you using? The colors that you chose are very pretty. I can’t wait to finish my dishcloths and start an afghan! I haven’t decided yet, but I am leaning black. Although I have seen some really fab ones with vivid blue or white. We’ll just have to see what happens. And since I have several hundred more squares to make before then, I guess I have time! I found the pattern on ravelry, but you can get it off the coats and clark website for free. It is called “graphic granny afghan” by Katherine Eng. Good luck! Black would make a cool stained-glass effect. White would make it more springish. I could see green, too, for leafiness between the flowers. Fun stuff! I had a brightly colored granny afghan joined with black given to us as a wedding present. It was lovely. It’s long gone now. WordPress didn’t like Pentajane’s link. Let’s try this one. Okay, I have to admit, I just had my husband help me think of a word (I’m too tired to be typing things for public consumption), and with the power of a thesaurus, we came up with “lovable” or “enchanting” after I said no to about fifty words I feel like I overuse. So, pick whichever one you’d like – it’s a great blanket. Love it! 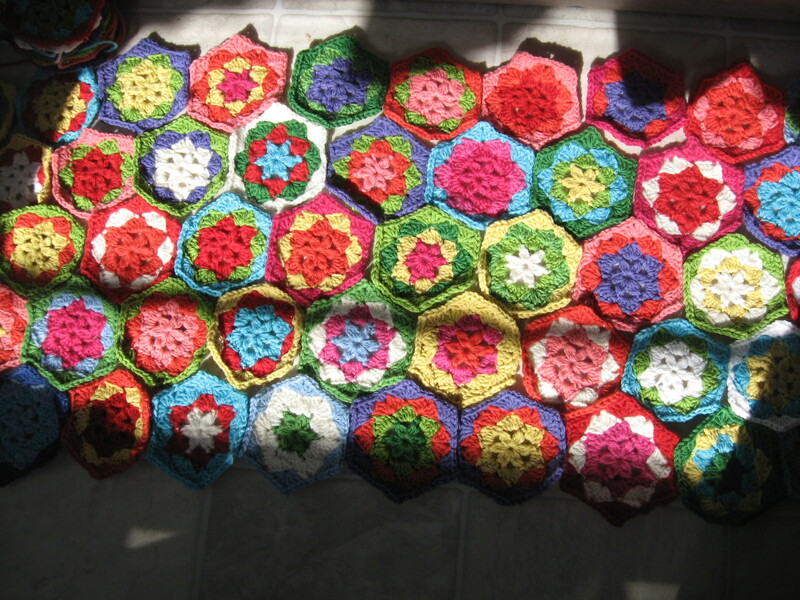 I have just been thinking lately of starting on granny squares and this may be just the final push I need. Yay! I’m freed from the fear of stalker status. I have added you – I’m hobbsandbean. 🙂 All your projects are so cute! I’m inspired now.